This article has been written for the Design Group Writing Project for Charity, an initiative set up by Jacob Cass. There are a lot of design related blogs out there. Some better than other, some are just getting off the ground and others are leaving. The quality between the blogs can differ a lot, but they all have one thing in common: Love for (web)design. This article will show the The roadmap from the Kingdom of design blogs, listing the greatest / biggest players in this game. These bloggers have the biggest influence on the design community, bringing you innovative articles every time a new one is released. They're always really creative and inspirational most of the time and bring you the highest quality of articles: These are the characteristics of some true royals. Don't forget the social communities that are dedicated to design too. Digg (Design), DesignBump, DesignFloat and the StumbleUpon Design Buzz. Take a walk down the red carpet and prepare to greet some royal blood based on their followers (RSS) count. The absolute emperor of the design kingdom has to be Smashing Magazine. With over 111 K inhabitants, the area and power of this emperor is huge. Founded in September 2006, Smashing Magazine delivers useful and innovative information for designers and Web developers. Our aim is to inform our readers about the latest trends and techniques in Web development: clearly, precisely and regularly. We try to convince you not with the quantity but with the quality of the information we present. That’s what makes us different. We smash you with the information that makes your life easier. Really. Smashing Magazine is maintained by Vitaly Friedman and Sven Lennartz. The king (or actually: queen) from the kingdom of design blogs is Veerle. She has almost 27K followers that check what she's been doing. With her wide variety of articles about (web)design, she can wear the title queen with proud. Veerle Pieters is a graphic/web designer living in Belgium. My personal journal is an online source for topics ranging from XHTML/CSS to graphic design tips. She's the CEO of Duoh! n.v. and live in Deinze, Belgium a small but beautiful country in the heart of Europe. PSDTUTS, the tutorial site with the highest quality of Photoshop tutorials, is the Grand Duke of this kingdom. With over 25+ K citizens, Collis Ta'eed can be really proud of his work. Since PSDTUTS is a community-written blog, there are several authors contributing to the site. Even you could be a writer for them, so you can feel how royalness would feel like. A couple of days ago, archduke Jay Hilgert welcomed the 20K inhabitant of Bittbox. With his sense of humor, great articles and high quality freebies, the citizen count will keep on rising. Hi everyone. My name is Jay Hilgert. I’m a Designer, Blogger, Web Enthusiast, and an Apple Geek, This blog is my little corner of the web. My main job description would be a “Freebie Maker” if you had to describe what I spend most of my time doing. I like to give away only the best quality stuff to help designers everywhere. Nick La has a great UI of his property. N.Design Studio and Best Web Gallery are other lands owned by Nick, but the 18+ K webdesign addicts following, listening and learning from him, made Nick the duke of design. Web Designer Wall serves as my public blog where I post my design ideas, tutorials, and talk about modern web design trends. Why Web Designer Wall? As a designer, I often have a lot of ideas that flow in my mind; usually I draw them on my sketch pad and then paste on the wall. This is how the name was created - a wall of ideas. Founded in 2006, Fabio Sasso did a splendid job on creating and developing Abduzeedo. Currently serving over 13 K people he abducted, which makes him marquess of design. Abduzeedo itself is the blog with the most frequent updates. The idea behind this blog is primarily to be a channel for me to write down some ideas, experiments, news, and a lot of thing that I see online and probably will forget in a couple of months. Basically it is an archive of my adventures online as a designer on the daily basis. Abduzeedo is maintained by seven authors and several contributors. Noupe targets a wider kind of audience than most design blogs, by adding high quality webdevelopment articles. Having almost 13k peasants checking out the superb site, Noura Yehia is a growing margrave of design. Count Chris Coyier (nice alliteration) just re-designed his land in an awesome way. The very innovative count gives tips and tricks about CSS, but lately also about JQuery. The fast growing inhabitant count is currently measuring over 12K inhabitants. The Go Media Arsenal is a super high quality place to buy some brushes and vectors. The blog this team is writing on (GoMediaZine), writes about the team experieces and (mostly vector) tutorials. Serving almost 11K skull / vector-freaks, this viscount of design has a nice and solid place in the kingdom. Go Media is a group of guys and girls who are passionate about art and graphic design. Now you’re reading a blog basically filled with lots of helpful tutorials and advice about business and design. But that’s not all Go Media does. In fact, we spend most of our time designing for clients or cranking out design resources for the Arsenal. The GoMedia team excists of twelve people in Cleveland. There are actually a couple of barons in the kingdom of design. They all have over 10K citizens and high quality, which made it impossible for me to choose just one of them. Chris Spooner, one of the barons of the design kingdom, is writing on blog.spoongraphics.co.uk . Currently also writing for VECTORTUTS, this freelancer must be a real busy person. With over 10K followers, I can't blaim him. His blog is a place for great tutorials and freebies. Blog.Spoongraphics was established as my personal playground where I could experiment with my interests in Graphic and Web Design without limitations. It is a great way to put my personal ideas into practice through tutorials and free giveaways, and to help keep myself updated on the latest industry trends through subscribing to similar websites and blogs. Six Revisions (Together with Noupe and WebDesignerWall) is one of those blogs where almost every article hits the front page of Digg. This should give a good indication of the high quality articles owner Jacob Gube is writing. Although Six Revisions isn't fully about design (Photoshop, Illustrator etc. ), it is more focused on webdesign / development. This baron is also feeding over 10K inhabitants. Last (but not least) on this list of the kingdom of design, we'll find TutorialBlog. The third baron with over 10K citizens, TutorialBlog serves Design Articles and Tutorials. Tutorialblog was started in 2005 to provide Photoshop Tutorials on various techniques and effects. It was acquired in 2008 by Hecta Media with aims of broadening the scope of the site and becoming a useful resource for beginner and intermediates alike. That concludes this list of royal design blogs. Did I miss something? 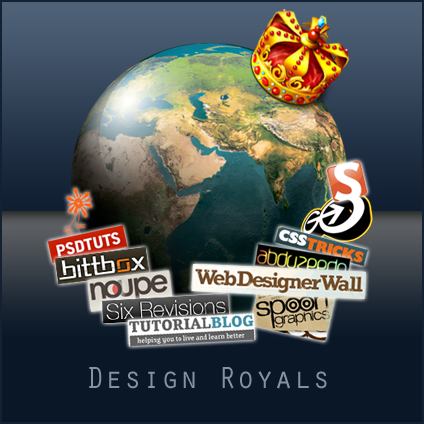 Are there blogs out there that are royal too, or should some of the above blogs be de-throned?